Digital technology has changed retail. You can now buy an item from your phone and have it shipped to you without ever visiting a store. If shoppers actually visit a retailer, they often encounter digital technology such as screens, mobile app integration, augmented and virtual reality, and mobile payments. These digital experiences can help attract, engage, inform, and connect with customers and make the shopping process more valuable, seamless, and influential. Digital channels, including your website, app, and social media can all reach customers before they get to your store. Your presence in these channels will help communicate your brand value and build your reputation. Once a potential customer is physically outside your store, digital signage can help attract them inside. This signage should feature content that is dynamic and relevant to catch attention, spark curiosity, or increase excitement. Depending on your brand, it might be bold and bright, calming and appealing, or showcase promotions. 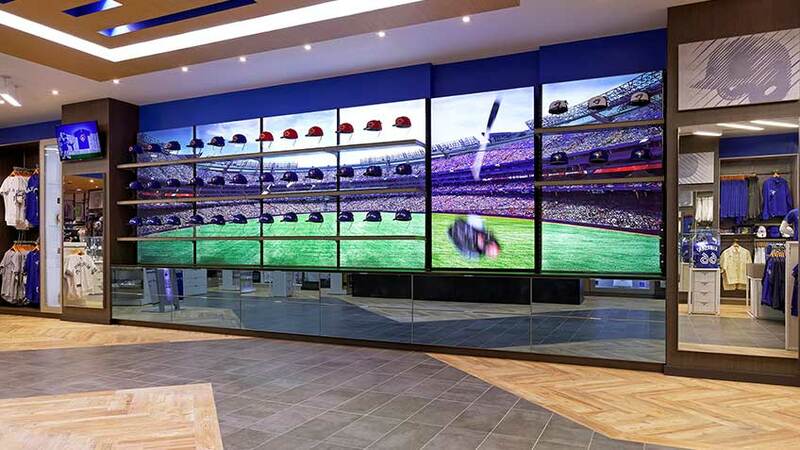 In the Toronto Blue Jays Shop, an eye-catching digital entrance-way invites customers in and helps create a unique brand experience. Beacons and notifications sent to the mobile phones of customers in close proximity to your store can also provide personalized incentives for them to come inside. Inside a store, digital technology can be a valuable tool. Queuing information: In the telecommunications store Flow, digital technology is used to help reduce anxiety and crowding through a system that directs customers to the right department and manages large numbers of people. Product trial:Many clothing and make-up retailers use smart mirror technology to allow customers to virtually try-on items and see how products will look. Dynamic communication:Digital screens can be used in the same way as printed posters that communicate key information about product offers and brand identity. However, they also offer the added benefit of being able to display dynamic content that can change throughout the day or in different seasons. To increase the effectiveness of digital signage, ensure that the content is relevant and engaging and that it is strategically located where customers will see it. Avoid annoying or repetitive displays. Interactive exploration:Digital screens can also be interactive, where customers are able to explore in-depth information about products. This two-way interaction allows more control over a retail experience to cater to different needs. The adidas Golf shoe display, for instance, allows customer to learn more information about each shoe by picking it up. The footwear rests on a sensor-enabled platform, and relevant content about each product is displayed on the screen when a shoe is lifted. Digital can be used to connect with customers through immersive experiences. Recent developments in technology are enabling more compelling and unique retail experiences to emerge, which present a strong brand identity and an opportunity to strengthen customer loyalty. Augmented reality and virtual reality add sensory elements into a store such as strong visuals, music, scents, touch-screens, or motion-controlled interactions to make it more immersive. Fun and interesting experiences and games in retail offer in-person interactions that set physical stores apart from other channels and make them more appealing to visit. Once a customer has made their purchase decision, digital payment capabilities such as Apple Pay and Google Pay can make the process smoother and signal to your customers that you are a modern brand. Some retailers such as Amazon Go are even doing away with checkout payments altogether; using technology to offer a “Just Walk Out” shopping experience that automatically detects which items you have taken and charges your account accordingly. Even when a customer has left your store, there is still an opportunity to leverage digital to enhance their experience and build loyalty. Social media and website sections to discuss products can help create a community and develop customer brand ambassadors. From pre-visit to post-visit, digital technology can be a useful tool in creating stronger brand connections and more seamless experiences. As it continues to become more sophisticated, digital elements that are creative and innovative will give retailers a distinct advantage from their competitors.